Why do I get along better with kids than adults? Last week I started to get involved in the “Day-in-a-Sentence” post over at Kevin’s Meandering Mind. 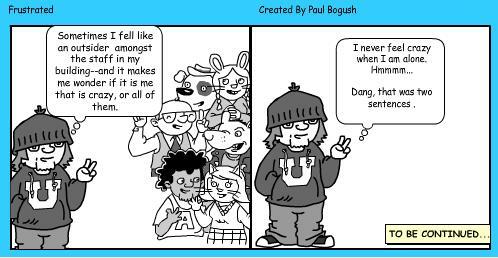 This week he challenged everyone to use a comic to represent their “day-in-a-sentence.” Mine ended up focusing not on a entire day, but about a two minute period of time that kind of overshadowed everything else I did. Click on the comic to enlarge and read. «What kind of jobs are you preparing you kids for? »When will creativity triumph over worksheets?